Super Savings Item! Save 32% on the Winchester 12 Piece .30 Caliber Rifle Cleaning Kit by DAC at Freedom from Government. MPN: WIN30LR. Hurry! Limited time offer. Offer valid only while supplies last. 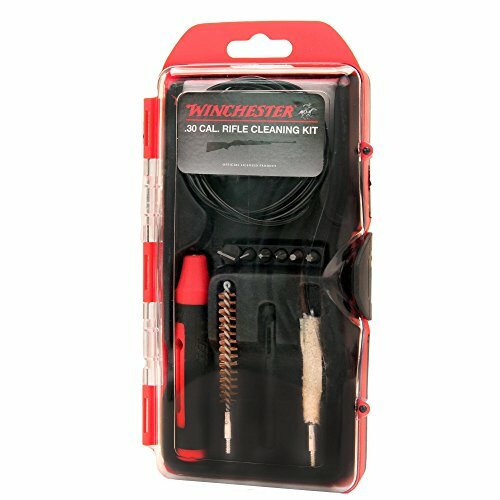 WIN30LR: WINCHESTER 30 CALIBER 12 PIECE RIFLE CLEANING KIT Includes: Red Winchester case, hybrid multi-function handle, 33'' pull rod, one .30 cal. WIN30LR: WINCHESTER 30 CALIBER 12 PIECE RIFLE CLEANING KIT Includes: Red Winchester case, hybrid multi-function handle, 33" pull rod, one .30 cal. brush, one .30 cal. mop, one .30 cal. slot tip, 25 patches, 6 piece bit set (2 phillips, 2 flat heads, one star and one hex).